I love the gloppy mayonnaise laden style of potato salad but my boyfriend doesn't. 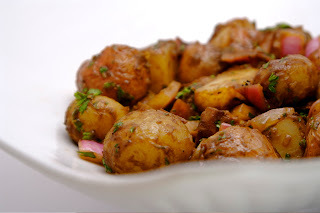 This warm potato salad is a perfect compromise. I found this wonderful recipe for a grilled potato salad while browsing grilling ideas. We were having company over for an afternoon BBQ and I thought this would be a perfect time to try it out. I liked the idea of serving the potato salad warm. This way, the potatoes really soak up the vinaigrette. Of course grilling the potatoes and onions adds such a great smoky flavor to the dish. The potato salad was a huge hit, everyone loved it. Perhaps the best thing about this salad is that it's just as good the next day. Mix together all of the dressing ingredients. Precook the potatoes as described above until just fork tender. Preheat the grill. Thread the potato halves onto skewers and lay the skewers on a baking sheet. Mix together the rest of the ingredients (not the dressing ingredients) and brush the potato skewers and onions lightly. Place the skewers and onions on the hot grill, and cook, turning as needed to brown all sides, until the potatoes and onions are tender and lightly browned. Remove the potatoes from the skewers and the onions from the grill and place them in a large bowl. Pour the dressing ingredients over the potatoes and onions. Carefully toss to coat well and place on a serving platter. Serve warm or at room temperature. This sounds so good, I like what you've done with the potato salad :) the dressing sounds delicious, I love capers. I love capers too. It's great with the potatoes being warm, they soak up all of the dressing. So good! I'm a potato lover, and this sounds amazing! I'm so with you on loving potatoes. Being so, I bet you'll love this salad. Let me know if you try it.